The first vaults to be constructed at Camden Town Depot were those under the locomotive engine house, built by William & Lewis Cubitt in 1837. The stationary winding engine vaults, built by the same contractor over 1836-7, were completed at about the same time. The goods sidings were supported on a complex of vaults and retained embankments that provided goods storage and stabling. There are few descriptions of this first phase of development and only a small part survives under the NLR at Horse Tunnel Market. Serpentine walls were constructed in the area of what is now Stables Yard over 1837-9. The purpose of these walls was to retain a multiple-lobed embankment for the rail sidings in the goods terminus area. The sidings were supported at least in part with vaults rather than earth. The vaults under the approach stem and those supporting the No. 1 Goods Shed, on the southern side of the stem, were arranged to fit within these lobed sidings. 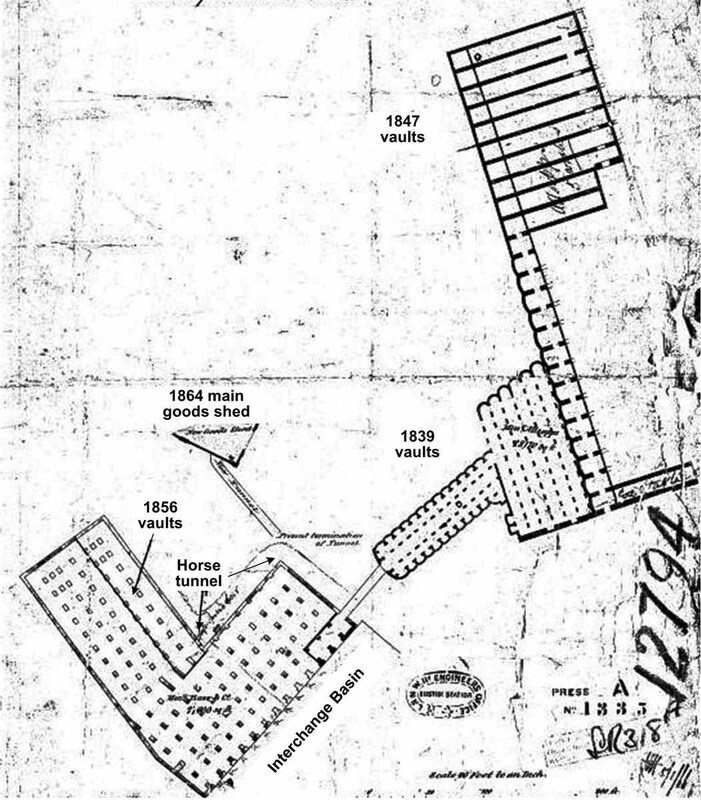 George Scharf, a keen observer of the changing face of London in the first half of the 19th century, made what appears to be the only sketch of the construction of the rail sidings of the Goods Depot in June 1837. 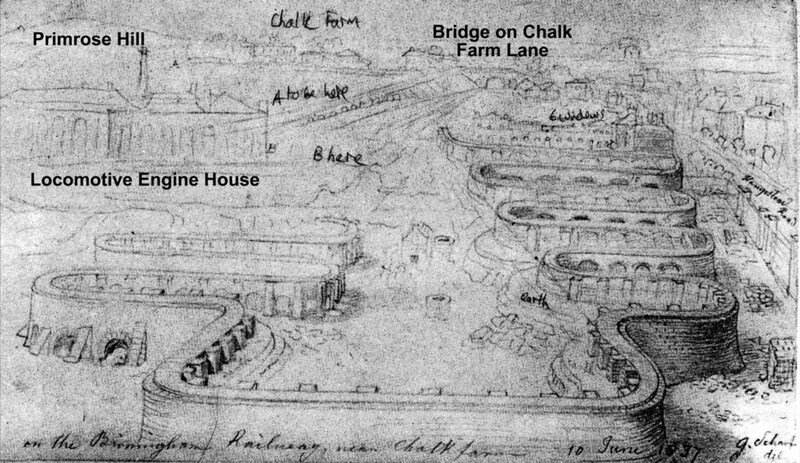 His sketch, looking west from what is presumed to have been the offices, shows the retaining walls for the goods sidings with Hampstead Road on the right. It would appear to have been drawn from at least a three storey building, perhaps enhanced to give a bird's eye impression. The rail approach to the Goods Depot was directly in line with the artist’s view and goods wagons would be turned into the sidings along the ‘fingers’ created by the foundation vaults. The sketch clearly shows the elevation of the railway level above street level in the right foreground. It also shows some earth deposited inside the walls, and shafts for manholes to a sewer that was laid down the centre line. The curved external batter of the walls in the foreground, with counterfort buttresses to their rear, is the characteristic style used at that time for retaining earth. The boundary wall along the Hampstead Road was smaller than the road we now see as it was not required to retain higher land behind. The vaults are constructed of red brick on concrete footings. The main span of the vaults was 12 ft (3.7 m), the distance between pairs of rail tracks. 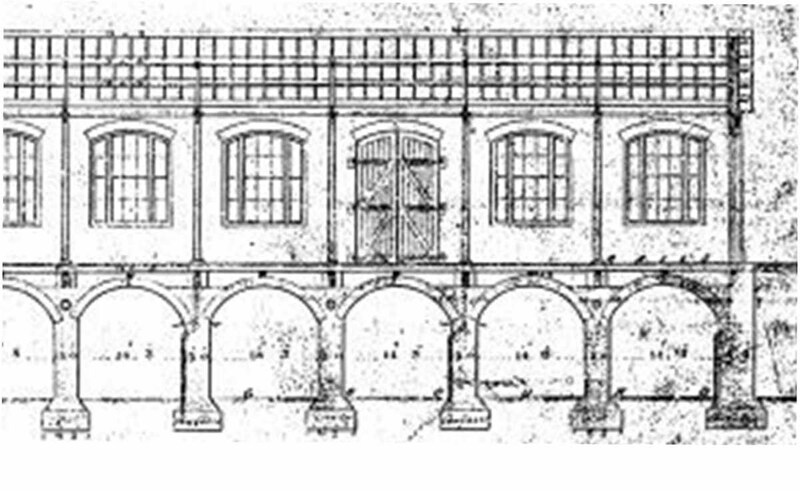 In the direction of the rails, the modular distance of the arched openings was 10 ft (3.0 m), made up of arches 6 ft 3 in (1.9 m) wide and arch piers 3 ft 9 in (1.1 m) wide. Drawings show a height of 15 ft 6 in (4.7 m) from ground level to the level of the rails. The height of the major arches is 11 ft 10 in (3.6 m), and that of the side openings is 7 ft 3 in (2.2 m). A photograph of the vaults in 1987 shows how the rough paving of the vaults has been locally smoothed off along a main access route for the passage of barrows and possibly horses. The rectangular grid of tunnel vaults at the rear of Stables Yard was constructed in 1846-7 as the substructure of a Construction Shop intended for the repair of railway wagons under the supervision of Edward Bury as locomotive superintendent. This was part of a larger scheme of works that was drawn up by the L&BR’s resident engineer, Robert Dockray. The building measured 435 ft (133 m) by 70 ft (21 m) and was covered by a roof in two spans. It was built by George Branson and Edwin Gwyther of Birmingham, who tendered £12,366-15s for the Construction Shop, including the vaults. 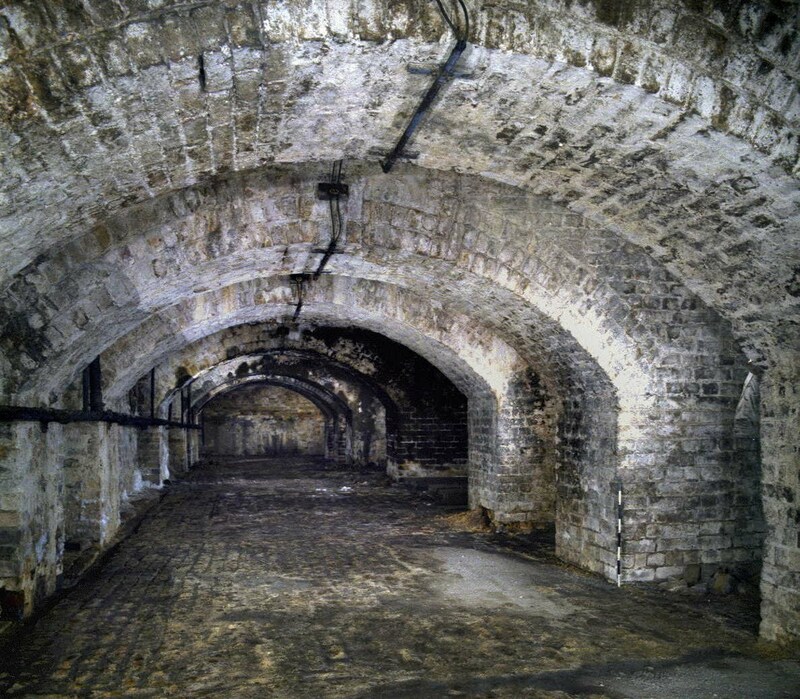 The area of the vaults was quoted as 43,340 ft² (4026 m²) viz. 25 vaults over a length of about 435 ft (133 m) and a depth from front to back of 95 to 105 feet (29 to 32 m), or about an acre (0.4 hectare). The numbers of arches and their alignment remains clearly discernible today, despite much alteration over several phases. The main arches have a 14 ft 3 in (4.3 m) clear span, and are 12 ft (3.7 m) from ground level to the crown with 3 ft (0.9 m) piers (see picture). The transverse arched openings are 5 ft (1.5 m) wide with 3 ft (0.9 m) piers. They are only about 6 ft (1.8 m) high from ground level, but they have inverted arches at the bottom, on top of the footings. 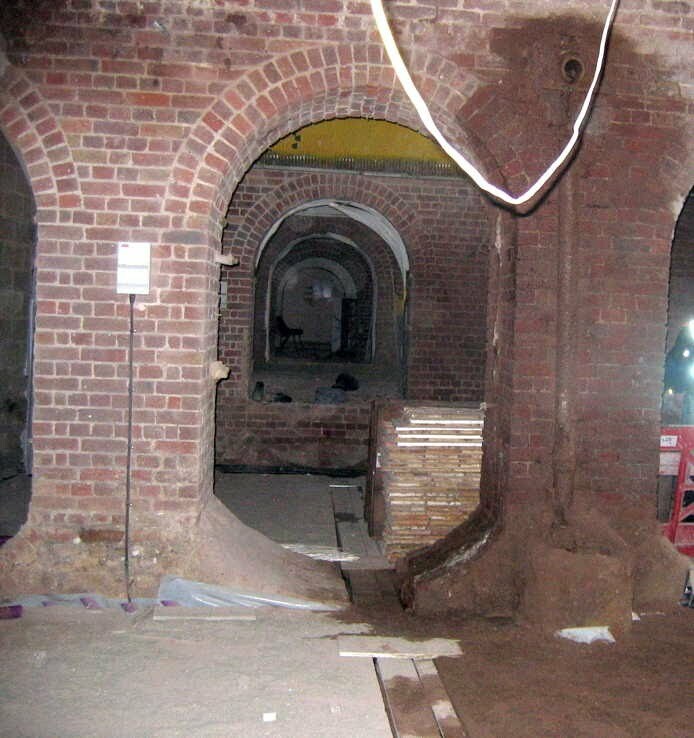 These can be seen in a photograph taken during redevelopment in 2009 of the area that had become known as ‘Camden Catacombs’. The Construction Shop stood on the northern edge of the vaults, which extended about 25 ft (7.5 m) further south to back onto the embankment of the Goods Depot. Only eight years later, when the Goods Depot was replanned, the Construction Shop was removed and the NLR (built in 1850 on a viaduct that followed the original goods sidings alignment) was slewed northwards. 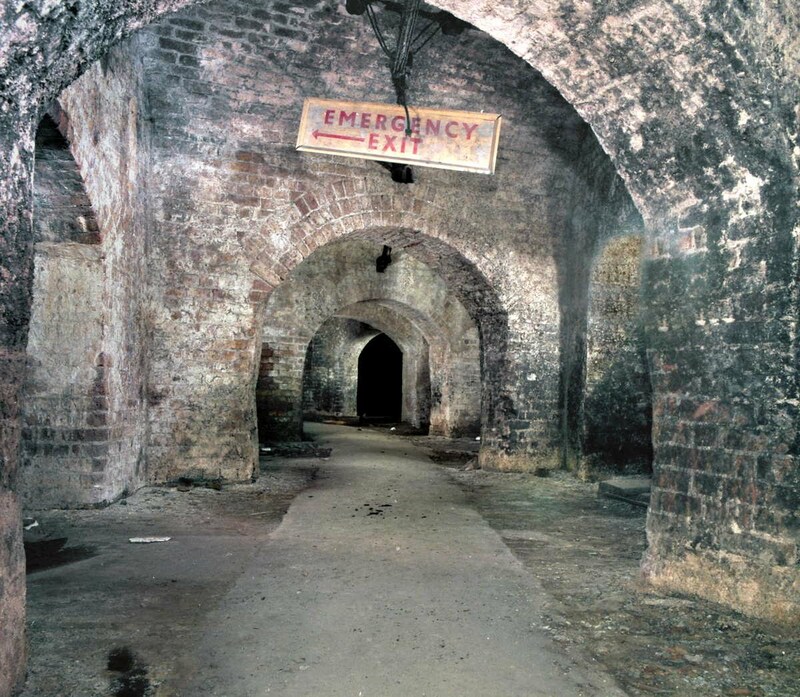 The 1847 vaults then supported the NLR on the curved diagonal alignment it follows today except at the west end where the vaults needed extending. As part of this 1854-6 reconstruction, coal drops were provided on sidings that ran to the north of the vaults that had supported the Construction Shop, and the main arches were extended up to them. Ventilation openings were cut through the vaults to fit between the new rail tracks. In 1995, Railtrack sold the freehold of the land north of the NLR, and required the vaults to be cut back to the diagonal line of tracks. This was done in 2007 as part of the redevelopment of Stables Yard. The severed brickwork was refaced with reclaimed yellow stock bricks covering a concrete front to the vaults, and can be mistaken for a purpose-built viaduct. As part of the same development, the transverse vaults were closed in order to create another series of linear retail shops and the lengths of some of the main arches reduced. The floor level was also lowered, exposing some of the inverted arches above the footings. In 1854-6, as part of the major reconfiguration of the goods yard, the railway level was extended south and east along the canal from Southampton Bridge to beyond the east side of the Interchange Basin. The basin was rebuilt with the same canal frontage but a different alignment. It was increased in size to 210 ft (64 m) by 45 ft (14 m) to take six barges, and this basin remains. On the west side of the basin, the level was raised by a set of vaults that ran in an L shape, both along the basin and along the canal, as shown in the 1866 plan. These were built to provide storage for Allsopp’s ales and beers. The coke ovens had to be removed to allow this. The major vaults run east-west, and are 12 ft (3.7 m) wide, about 9 ft 6 in (2.9 m) high from the floor to the crown of the vault, and have 3 ft (0.9 m) wide footings. The transverse openings in these vaults are only about 6 ft (1.8 m) in height and vary in width from 11-13 ft (3.4-4.0 m), with 4½ ft (1.4 m) footings. The vaults connect on the east side with the Interchange Basin. On the west side there is an opening to the Eastern Horse Tunnel. The vaults later also connected with the 1839 vaults via the connecting tunnel shown in the 1866 plan. A single storey shed in three spans of different width was built over the basin and over the vaulted area alongside. Recently the canal side arm of the L shaped vaults has become the basement of the new development at 30 Oval Road, and most of the vaulting below this arm has been demolished.